What a beautiful day. After last night’s torrential downpour, the skies cleared up, right before 8:30 AM, the time designated by Team Leader Jen for the troops to gather. We met at the Southeast corner of Fullerton and Cannon on this most unusual April day to remember two brave women, Grandma June and my sister from another mister, Jesika Brooke Thompson. We talked, we ate, we enjoyed the sunshine, but most importantly, we came together to walk for a cure. As the emcee correctly stated during the walk’s opening ceremonies, half the cause of ovarian cancer’s high mortality rate is its difficulty to detect. At this time, no reliable test exists of the kind that has been developed to suss out other female cancers (pap smear, mammogram). No one learned that lesson the hard way more than Jesika, who collapsed from a pulmonary embolism one day, just to find out that Stage 4 of the disease had already taken over her vital organs. 17 days later, on April 25, 2009, we said goodbye. However today was not a day of sorrow, though I did breakdown toward the end of the opening procession. A group of survivors graced the stage and my heart burned, for several moments, with the intense desire to pull a rabbit from a hat and see Jesika standing up there alongside the other women. Danielle and Gary, the completing sides to our high school foursome, joined me for an indulgent moment of sorrow, and a hug before I tried to pull myself together. The warm sunshine beamed down on our faces as we walked the three mile course from Fullerton and the lake shore, to Diversey, up West for a bit, and then back to the starting line. Max entertained the walkers with a lovely Black Eyed Peas/Beyonce medley. KK and I were joined at the hip as always. And the fifteen members of our team, many of whom were strangers before today, chatted with the ease of old friends. 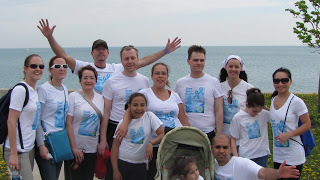 We raised $1000 for the 13th Annual NOCC Illinois Chapter Walk for Ovarian Cancer, and I think we all enjoyed it so much, we plan to make this effort an annual event. I hope next year Kevin is able to join us. I want to personally thank all of the friends, family and loved ones who either walked with us today, or donated generously. Some people did both and for that, Jen and I are especially grateful. I want to end with a note of overwhelming gratitude to my sister, co-blogger and Team June/Jesika’s able Captainess, Jen of All Trades. I very much wanted to participate in this event and know I would have done it solo. But I am still too raw, I think, to have coordinated a group effort, which made that much more impact. It is something special to have a sister who reads your mind, and then is strong enough to accomplish for you what you aren’t able to do alone. I am glad we were able to honor Grandma and Jesika’s lives this way. Jen’s hard work and leadership made that tribute possible.